Prominent & Leading Exporter from Nagpur, we offer capnea injection. 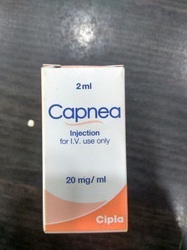 How To Use Capnea Injection:Your doctor or nurse will give you this medicine. Kindly do not self administer. Capnea Injection is a stimulant. It works by blocking the action of certain natural substances (adenosine and phosphodiesterase) leading to stimulation of the brain and respiratory system in premature newborns. This reduces the number of episodes of interrupted breathing and helps the newborns breathe on their own. Animal studies have shown adverse effects on the fetus, however, there are limited human studies. The benefits from use in pregnant women may be acceptable despite the risk. Please consult your doctor.LactationCAUTIONCapnea Injection should be used with caution during lactation. Breastfeeding should be held until the treatment of the mother is completed and the drug is eliminated from her body.DrivingCapnea Injection may make you feel dizzy, sleepy, tired, or decrease alertness. If this happens, do not drive.KidneyThere is limited information available on the use of Capnea Injection in patients with kidney disease. Please consult your doctor.LiverThere is limited information available on the use of Capnea Injection in patients with liver disease. Please consult your doctor.